A Poisoned Arrow — The Contemplative Life. 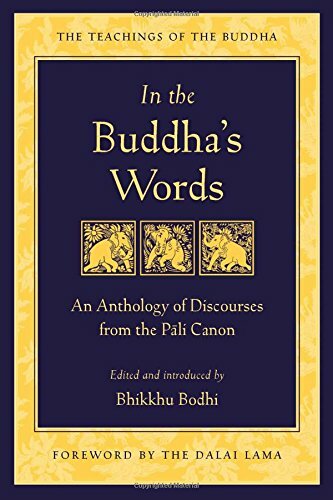 The following is a famous passage from the Pali Canon which is often used to claim that the Buddha was strictly practical, and did not make metaphysical claims. The passage certainly affirms this, but it must be held in balance with other Suttas which show the Buddha accepting the existence of various metaphyiscal realms, the reality of reincarnation, etc. I don't think it's accurate to say that, "the Buddha didn't make any metaphysical claims." But I do believe we can say that he downplayed their importance in favor of practical spiritual practice. In this passage, a disciple declares that he will not follow The Master unless he declares his position on various metaphysical statements. In response, the Buddha gives an example of a man wounded by an arrow. The man will not let the surgeon pull the arrow out until he knows who shot him, what he looks like, where he lives. The wounded man dies without knowing the answers. In the same way, we will die without knowing the answers to a host of metaphysical questions. What we should be concerned about, according to this parable, is how to pull out the arrow of suffering in the here and now. Therefore, Malunkyaputta, remember that what I have left undeclared as undeclared, and remember what I have declared as declared. And what have I left undeclared? 'The world is eternal' - I have left undeclared. 'The world is eternal' - I have left undeclared. 'The world is finite' - I have left undeclared. 'The world is infinite' - I have left undeclared. 'The soul is the same thing as the body' - I have left undeclared. 'The soul is one thing and the body is another' - I have left undeclared. 'After death a Tathagata does not exist' - I have left undeclared. 'After death a Tathagata both exists and does not exist' - I have left undeclared. 'After death a Tathagata neither exists nor does not exist' - I have left undeclared. Why have I left that undeclared? Because it is unbeneficial, it does not belong to the fundamentals of the spiritual life, it does not lead to disenchantment, to dispassion, to cessation, to peace, to direct knowledge, to enlightenment, to Nibbana. That is why I have left it undeclared. And what have I declared? 'This is suffering' - I have declared. 'This is the origin of suffering' - I have declared. 'This is the cessation of suffering' - I have declared. 'This is the way leading to the cessation of suffering' - I have declared. Why have I declared that? Because it is beneficial, it belongs to the fundamentals of the spiritual life, it leads to disenchantment, to dispassion, to cessation, to peace, to direct knowledge, to enlightenment, to Nibbana. That is why I have declared it. Therefore, Malunkyaputta, remember what I have left undeclared as undeclared, and remember what I have declared as declared. That is what the Blessed One said. The Venerable Malunkyaputta was satisfied and delighted in the Blessed One's words."